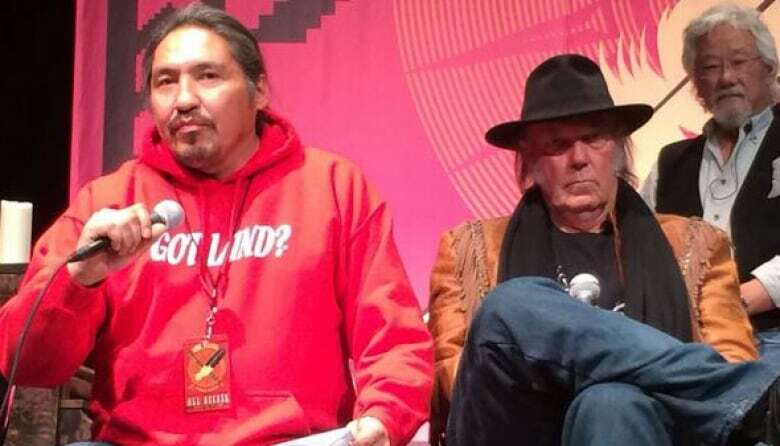 Folk-rocker Neil Young arrived in Regina Friday with his anti-oilsands message. 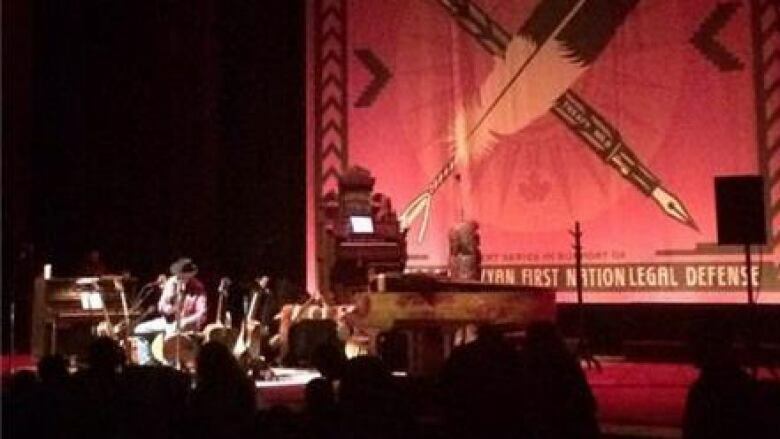 He also took to the stage at the Conexus Arts Centre for a sold-out concert. 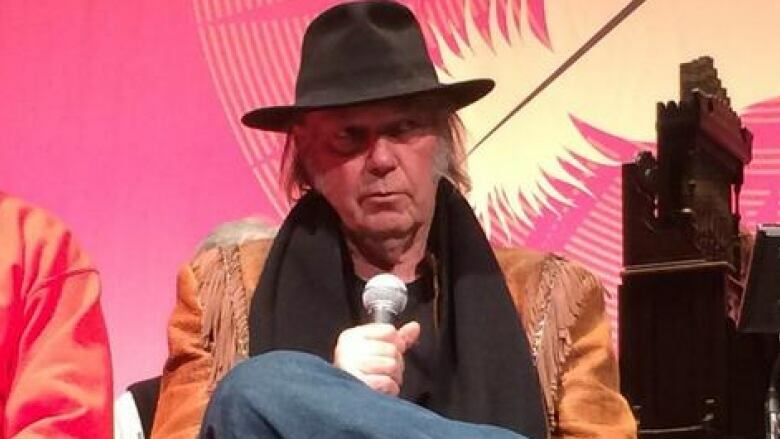 Folk-rocker Neil Young arrived in Regina Friday with his anti-oilsands message. He also took to the stage at the Conexus Arts Centre for a concert. The famed singer is touring and raising awareness in what he has dubbed his "Honour the Treaties" tour which is also raising funds for an Alberta First Nation. The Athabasca Chipewyan First Nation is downstream from oilsands developments and has filed a lawsuit to try to protect its traditional territory from further industrialization. Chief Allan Adam appeared at a news conference with Young and environmental commentator David Suzuki ahead of the concert. Adam wore one of the bright pink hoodie-style sweatshirts with the message "Got Land? Thank an Indian". The shirt has been in the news recently, after a Saskatchewan grade eight student was told not to wear it at school. Tenelle Starr was told some people in the school's community of Balcarres were offended by the message. After meeting with First Nations leaders, school officials relented and said it would be OK for the shirt to be worn. Starr and her mother were also given tickets to Young's concert and attended the show. Young spoke positively about the message of Starr's shirt. "This shirt is reality," Young said. "There is nothing wrong with it. We should all be proud of it, That there is a heritage. That Canada goes back and it came from the First Nations. That we made these peaceful arrangements, these treaties." Also during the news conference, Young said he grew up learning to "clean up your mess, keep your word." He said those lessons should be applied to the oilsands developments. Young recently said he had visited the oilsands area around Fort McMurray and compared the long-term damage done to Hiroshima, the Japanese city destroyed by an atomic bomb in 1945. Before his show in Winnipeg, Young also criticized the proposed Keystone XL pipeline, a major oil project that would run through Western Canada and the United States. Asked about Young's comments a few days ago, Premier Brad Wall said it's a free country and Young is entitled to his opinions, although he took issue with the Hiroshima comment, saying it hurt Young's credibility. Replay the Saskatoon Morning live chat about Young vs. the oilsands.